Stealth Electronics Ltd with the Series 2000 Controllers can offer the very latest technology for the quality storage of crops. The Controllers Series is a stand-alone controller that will make the best decisions of when to operate the fans, louvers and fridges to control the storage environment and preserve the crop in the ideal conditions. Typical storage applications include Onions, Potatoes and Cereals. 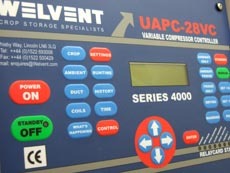 As with many of our crop storage products the Series 2000 controllers can be networked together and connected to a PC computer. Networking involves daisy chaining a serial connection between all the controllers and the PC. This allows the various stores information from the site to be collected and displayed from a common point. Many of our customers prefer the ease of use of the Windows programs to adjust the controller settings and interrogate the controller readings. All user operations are controlled via the mouse and are simple to operate. 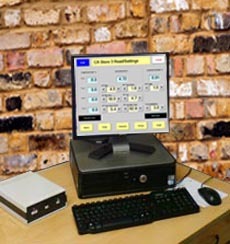 The computer network allows for the displaying of the temperatures and adjustment of the settings together with the output control status of the relays. Run timers can also be displayed and reset. 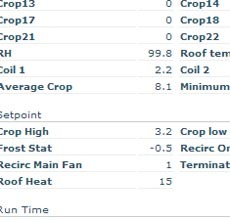 Users can request any temperature display from any controller on the network at anytime. All readings can be represented on a graph. 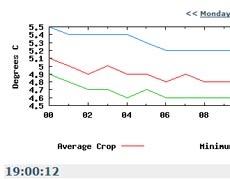 The graphs can also be printed on a colour printer. The system also allows for text messaging to mobile phones in the event of alarm conditions. This is where most of our competitors systems end. At Stealth Electronics we have developed the next phase of the communication revolution via the web. For an easy and cost effective approach, the System will upload the data to the Stealth Web Data System web site on an hourly basic. As uploads are once every hour the phone lines are not inconstant use and therefore no additional dedicated phone lines are required. The data is sent automatically to the web site. Once received the data can be accessed via the web. To look at the various readings simple access the web and after various passwords have been entered and verified, the user can interrogate the stores readings via the Internet. Indeed many people can access the data at the same time without conflicting with each other. This is a technological and innovative use of the web. Thus, access can be achieved from anywhere in the world at a low cost and without the normal non-compatible systems error that can occur with current communication software packages available. In fact no special packages are necessary. In basic terms, if you can get onto the Internet then you can access the store. This feature is particularly useful if the sites are in different countries around the world where costs of the phone calls start to add up at the end of the storage season. In our recent installations we have also designed a multi language software interface to make the software even more convenient between countries. This feature is easy to use just select the language you require from the selection on the web site. 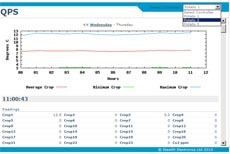 This Web graphical package allows for any input readings or set points to be displayed across any time frame. The screen can also be printed for hard copies. 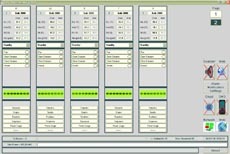 The system set points and the current run times of the various outputs can also be viewed. Full assistance to any problems that may occur. If you require any additional information please feel free to contact the sales office, we will be only too pleased to discuss your requirements. Rest assured that you can 'Buy In Confidence' as we are the designers and the manufactures of the crop storage equipment.